Matt Kleberg: "[37th Hour] was in a show in NYC last year. I was working on the paintings for that show while Liz (his wife)was pregnant and the show opened pretty soon after we had Waylon. The titles of the paintings all reflected the birth, and 37th Hour was in reference to the 37.5 hour long labor that Liz had, and the drawn out anticipation of it all. The meaning of the work for me, or at least the context that gives a painting a reason for being is always shifting. During Liz’s pregnancy, the empty niches in the work took on an expectant, anticipatory charge. They became about waiting and wondering about who this person coming into our lives was going to be. The paintings, in that regard, were 'pregnant spaces'." As you may recall, the Old Jail Art Center designated 2017 as the "Year of the Membership" and successfully increased our membership by about 120 percent. 2018 will be the "Year of Conservation" and will encompass a variety of initiatives. Conservation, preservation, sustainability, and stewardship are all related concepts that describe the multiple projects taking place throughout the year. Efforts to increase funding for much needed conservation and preservation on works in the art and archives collections will focus on the Fort Worth Circle paintings and the original Shackelford County courthouse drawings. The OJAC has already taken the first step in its conservation endeavors by submitting a grant to the Institute of Museum and Library Services (IMLS) to fund a survey of 83 paintings by Fort Worth Circle artists. During that process, it was realized that the OJAC has the largest holding of Fort Worth Circle art works by any museum in the world. The original courthouse drawings on linen in the OJAC's Robert E. Nail Jr. Archives are in need of stabilization and archival framing. These are just two examples on a prioritized list of collections care. The much-anticipated initial series of video interviews in the Ardon Judd Oral History project administered through the OJAC's Robert E. Nail Jr. Archives will debut in October. This project demonstrates the importance of preserving regional history, while also making that history accessible to visitors, students and researchers. This wealth of information will be valuable resource for research, education and enjoyment for current and future generations. The OJAC takes another step in sustainability by being awarded a grant from the The Green Mountain Energy Sun Club ® to install solar panels, which will reduce our energy expenses. Sun Club funds will also be provided for education programs that will dovetail with our current curriculum utilizing collection objects to promote stewardship and sustainability of our natural resources. Not only will the OJAC take a leadership role in this important endeavor for our region of Texas, but also reduce operating cost - directing those savings to other programs. These activities emphasize the imporantance of the OJAC as not only the primary repository of cultural and historical items and information, but also our obligation to protect and preserve that which we hold in public trust. OJAC Collection favorite Der Weg ins Blaue (The Path Into the Blue) will be on exhibit at the Pinakothek der Moderne in Munich, Germany this March. The Pinakothek der Moderne is one of the largest museums in the world for art, architecture and design of the 20th and 21st centuries. Gift of Bill Bomar, 1991.002. 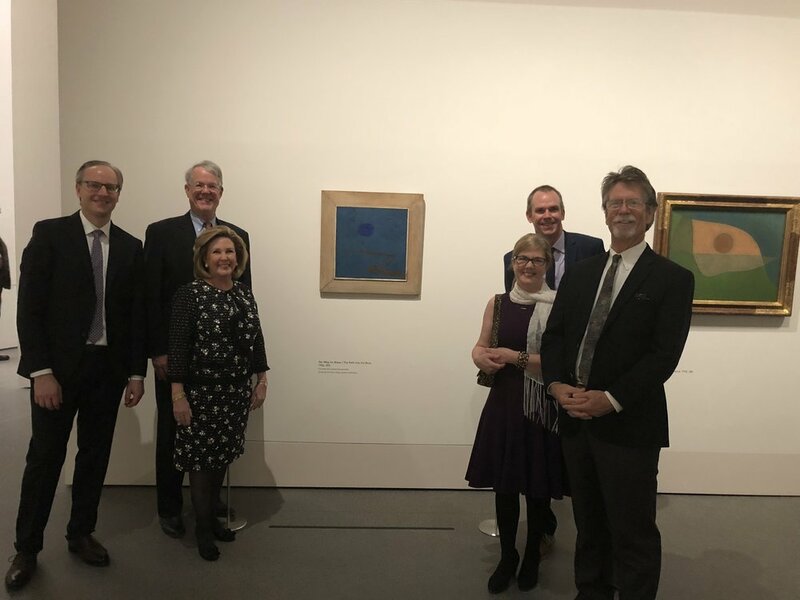 OJAC Staff and Board Members attended the opening reception of Paul Klee: Construction of Mystery. This exhibition will be on view at the Pinakothek de Moderne from March 1, 2018 - June 6, 2018.